My 12- and 13-year old kids are at a week-long summer camp in the mountains. But today I realize my heart is tangled up in gobs of love for my kids. And I already miss them. And I heard God whisper… Love — THAT is the good kind of tangle. Love wins. Love heals. Love changes things. But for many of us, we’ve been snared by tangles that are joy-killing, life-draining, heart-bruising, and confidence-squashing for most of our life. If that’s you (and honestly… who is it not? ), then you won’t want to miss this study. 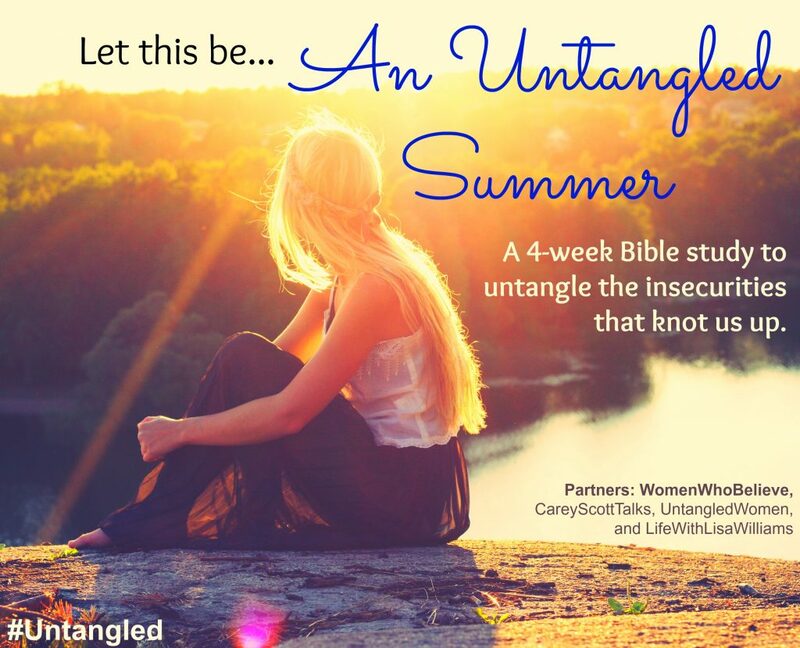 On Thursday, we’ll be officially kicking off An Untangled Summer Bible study with Women Who Believe. Through the month of July, we’re going to dig into 4 tangles that knot us up and wreak havoc on our self-worth. These are 4 biggies, and my guess is you’ll be able to identify with all of them — at least on some level, at least somewhere in your life. Shame – The feeling that who you are is bad and broken, keeping you from loving who God made you to be. Fear – The worry that you might fail, be embarrassed, get hurt again, be judged, or be ill-equipped to do what God is asking. Worthlessness – The belief that says you’re unlovable, not good enough, won’t measure up, and are insignificant. Unforgiveness – The lie that encourages you to live an offended life with a victim mentality, and weaves its way into your ability to love and trust again. Now some of you may be thinking… Why would I want to talk about those things? Summer should be light and fluffy, not opening up a can of worms. Or… I’m not struggling with those tangles. I’m all good! Or even… Why do these topics keep coming up? Enough already, God! And no doubt, several of you are exhaling a whisper of… finally. Girls… I hear you. I see you. I get it. Sometimes we are desperate to find freedom, but other times we want to fly under the radar so God doesn’t pursue our healing. We’re just trying so hard to hold it together so no one — including God — will see we’re tangled. But friend, don’t you believe God’s plan for your life is for healing? Don’t you understand that His best for you is restoration? Don’t you know He wants you to live untangled? Because this study won’t be a downer. It won’t leave you hopeless. And it won’t drive you into depression. Instead, you’ll be encouraged to let God loosen those knots that have choked your sense of worth for far too long. And when you become untangled, others around you will be encouraged to ask God for the same. 1) Purchase the book, Untangled: Let God Loosen the Knots of Insecurity in Your Life. 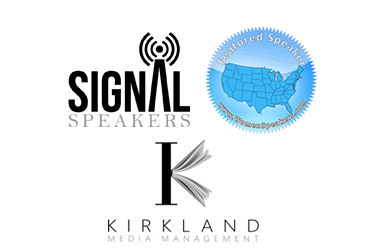 You can find on Amazon, or on Barnes & Noble, or anywhere books are sold. 2) Join the Untangled Women community on Facebook. This will be our virtual coffee shop where we can discuss that study together. It’s a closed group, so click here to be added. 3) Ask God to prepare your black and blue heart to receive all He has for you. Truth is, we cannot do this without Him. We can’t find lasting untangling with out the touch of Jesus. He’s the Divine Untangler. Lord, thank You for being in relentless pursuit of this sweet woman’s healing. Thank You for creating her with a future and a hope. And thank You for being faithful to loosen the knots of insecurity in her life. 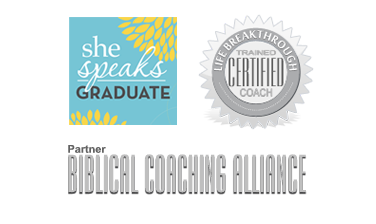 Would You use this summer study to be a catalyst to untangling her heart. Father, You know she has tried to manage her pain and hurt in unhealthy and inappropriate ways. We all have. And we don’t want to live like that anymore. Instead, help us anchor our identity in Jesus. We are saying yes to You. Thank You for Your willingness to rescue us. In Jesus name. Amen. Can you think of a friend who could use a little untangling herself? Why not share this post and invite her to join the Bible study too? There’s a place for every woman. 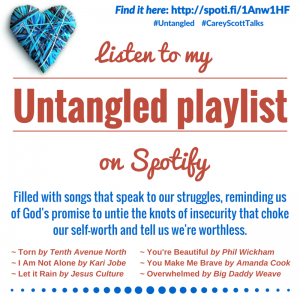 Oh, and did you know there’s an Untangled playlist on Spotify? Looking forward to this Bible Study. 🙂 Thank you. Glad you’ll be a part of it, Melissa! I may have missed it, but what time on Thursdays? Michelle… You haven’t missed anything. :). Watch my blog for details on Thursday. 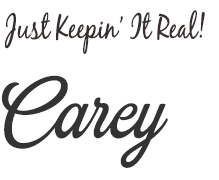 So glad you’re going to be a part of it, Cathy!